Lance Wright hasn't added a story. 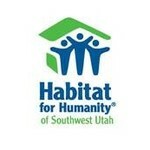 Habitat for Humanity® of Southwest Utah is a non profit building homes in Washington County, helping families achieve home ownership with a "hand up"! Lance Wright hasn't posted any updates yet.